As the Customer Service Manager of ArchVision (for nearly a decade), I am very excited to announce a new channel for customer service interaction. 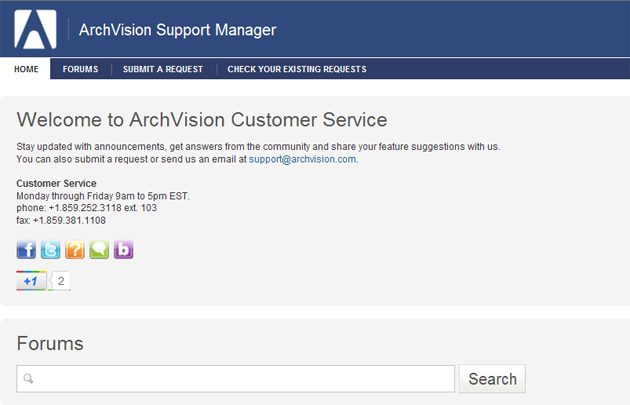 The ArchVision Customer Service channel offers more support options than ever before to keep our users connected to the information that they need to get the most out of their products. Here users can chat with live customer service representatives, submit support tickets, browse frequently asked questions, search a knowledge base, access help documentation, access tutorials, watch videos and even interact with social media like Facebook, Twitter and Google+. Support tickets help us to log data and better assist product design and development as well provide you with answers as quickly and efficiently as possible. ArchVision also incorporates the use of Go to Meeting software to assist in troubleshooting technical support issues. We offer “live” support via desktop meeting, chat and phone Monday through Friday 9am-5pm EST, excluding holidays. Serving nearly every inch of the globe ArchVision is a customer-centric company that is here to help. We value your business and will work to keep it. University of Kentucky Graduate (2001). Degree in Integrated Strategic Communications. Customer Service Manager ArchVision Inc. 2003-Present. Technical Support Specialist. Specializing in assisting users with all things RPC.